A healthy-ish pudding, you can enjoy this without too much guit, as it's packed full of healthy nuts and berries. It's also free from gluten, dairy and refined sugar. Line a 2-pint bowl or pudding basin with a double layer of cling film, leaving the excess hanging over the edges. Put the nut butter, coconut oil and honey in a large bowl and stir together until smooth and well blended. Reserve 1 tablespoon of each of the nuts and dried fruits for decorating, then add the rest to the bowl. Add the cocoa powder and orange zest and stir everything together well. Spoon the mixture into the bowl or pudding basin, smoothing the top level with the back of a spoon. Cover with the excess cling film and chill in the fridge for at least 8 hours or overnight, until set firm. Just before serving, bring to room temperature for 10 to 20 minutes or until soft enough to remove from the bowl easily. Meanwhile, to make the topping, put the cacao butter in a heatproof bowl set over a pan of simmering water or heat in 30-second blasts in the microwave, stirring frequently, until melted. Remove and add the nut butter and maple syrup and stir together until well blended. Leave to cool and thicken slightly. 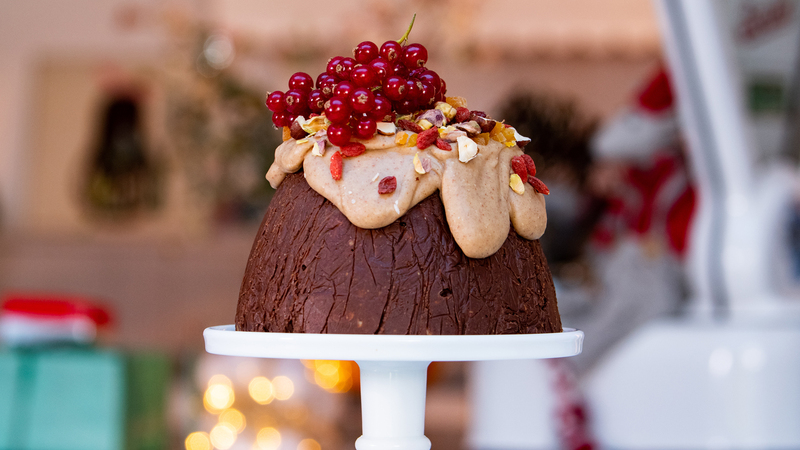 Turn the pudding out onto a cake stand or serving plate. Spoon the topping over and immediately sprinkle over the reserved nuts and dried fruit. Sit a string of redcurrants on top to decorate if liked. The topping should set firm almost straight away against the cold of the pudding. If any pieces are left over after serving, store them between sheets of baking paper in an airtight container in the fridge for up to three weeks.